Imagine! Teleportation as we all know from Star Trek can be possible! Or even nearly. With the Ready to Cloud project we propose a first trial on simulating a teleportation system within the possibilites of off the shelf materials. The main idea came from a broad and deep observation on diegetic prototyping and narrative methods of communicating utopian visions. The idea is to beam people realtime 3D-scans from one city to another, from one party to the next and by this creating an opportunity to set up a holographic display. In a bigger wind shielded space, like a hangar or abbondend dock a projector is set up. In 15 meters distance the cloud generators are placed. In front of the cloud machines is a ring, ready to teleport the digital self up into the clouds. This whole installation is simply controlled withan iPad that is connected to an all serving little PC hidden somewhere around! When a person steps into the teleportation zone, the cloud generators start and he or she will be three dimensionally scanned and displayed into the cloud. After one second another scanned person appears as a spatial – hologrpahic image. 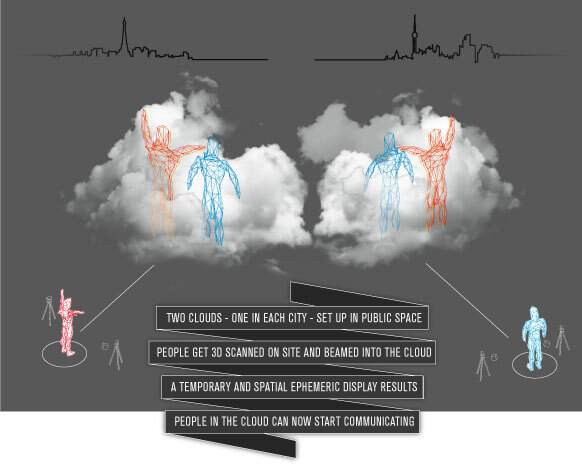 Now, meeting in the cloud, a spatial, real time, scaled sort of cloudy sky/pe is created to allow full body interaction. We showcase Ready to Cloud in it´s final state in some european cities this summer and autumn. For now we are in Milan prototyping it in the italian urban wild and show the iterations every night. The first prototype was to be seen during the Fuori Salone in Milan from the 8th of until the 13th of April. We set up the system, so people can teleport themselves from one point in the city into another, from Duomo to Tortona, from Linate to Politecnico. The exact dates are visible on the very extra website, that had been arranged and designed by the heads and hands of Stefano Mirti and Susanna Legrenzi. Due to the always little time and the wish of low complexity we tried to use off the shelf technology for the project. Nothing too complicated, nothing too supersmart or high tech. The aim is to realize yesterdays future with the means of today. For the project we did a lot of practical and poetic research in advance. We were scanning all the movies to get used to teleportation as all day practice. We were building software and hardware prototypes, mocking up all ideas. Here you will see some of the videos allready edited and cut for viewing pleasure. The whole filming, photoshooting and editing goes to Armin Riedels account! Thanks man! And not forget the copyright owners of the selected sequences in the compilations. Without them, future would be less impressive.